However, we use multithreading than multiprocessing because threads use a shared memory area. They don't allocate separate memory area so saves memory, and context-switching between the threads takes less time than process. Each process has an address in memory. In other words, each process allocates a separate memory area. Cost of communication between the process is high. Switching from one process to another requires some time for saving and loading registers, memory maps, updating lists, etc. Cost of communication between the thread is low. Note: At least one process is required for each thread. As shown in the above figure, a thread is executed inside the process. There is context-switching between the threads. 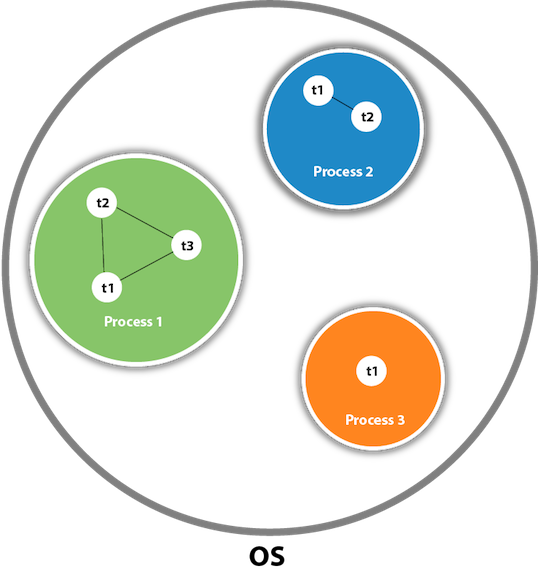 There can be multiple processes inside the OS, and one process can have multiple threads. Note: At a time one thread is executed only. Java provides Thread class to achieve thread programming. Thread class provides constructors and methods to create and perform operations on a thread. Thread class extends Object class and implements Runnable interface. 1) void start() It is used to start the execution of the thread. 2) void run() It is used to do an action for a thread. 3) static void sleep() It sleeps a thread for the specified amount of time. 4) static Thread currentThread() It returns a reference to the currently executing thread object. 5) void join() It waits for a thread to die. 6) int getPriority() It returns the priority of the thread. 7) void setPriority() It changes the priority of the thread. 8) String getName() It returns the name of the thread. 9) void setName() It changes the name of the thread. 10) long getId() It returns the id of the thread. 11) boolean isAlive() It tests if the thread is alive. 12) static void yield() It causes the currently executing thread object to pause and allow other threads to execute temporarily. 13) void suspend() It is used to suspend the thread. 14) void resume() It is used to resume the suspended thread. 15) void stop() It is used to stop the thread. 16) void destroy() It is used to destroy the thread group and all of its subgroups. 17) boolean isDaemon() It tests if the thread is a daemon thread. 18) void setDaemon() It marks the thread as daemon or user thread. 19) void interrupt() It interrupts the thread. 20) boolean isinterrupted() It tests whether the thread has been interrupted. 21) static boolean interrupted() It tests whether the current thread has been interrupted. 22) static int activeCount() It returns the number of active threads in the current thread's thread group. 23) void checkAccess() It determines if the currently running thread has permission to modify the thread. 24) static boolean holdLock() It returns true if and only if the current thread holds the monitor lock on the specified object. 25) static void dumpStack() It is used to print a stack trace of the current thread to the standard error stream. 26) StackTraceElement getStackTrace() It returns an array of stack trace elements representing the stack dump of the thread. 27) static int enumerate() It is used to copy every active thread's thread group and its subgroup into the specified array. 28) Thread.State getState() It is used to return the state of the thread. 30) String toString() It is used to return a string representation of this thread, including the thread's name, priority, and thread group. 31) void notify() It is used to give the notification for only one thread which is waiting for a particular object. 32) void notifyAll() It is used to give the notification to all waiting threads of a particular object. 33) void setContextClassLoader() It sets the context ClassLoader for the Thread. 34) ClassLoader getContextClassLoader() It returns the context ClassLoader for the thread. 35) static Thread.UncaughtExceptionHandler getDefaultUncaughtExceptionHandler() It returns the default handler invoked when a thread abruptly terminates due to an uncaught exception. 36) static void	 setDefaultUncaughtExceptionHandler() It sets the default handler invoked when a thread abruptly terminates due to an uncaught exception. How to perform two tasks by two threads? How to perform multithreading by anonymous class? What is the Thread Scheduler and what is the difference between preemptive scheduling and time slicing? What happens if we start a thread twice? What is the purpose of join method? Why JVM terminates the daemon thread if no user threads are remaining? What is the shutdown hook? What does the gc() method? What is synchronization and why use synchronization? What is the difference between synchronized method and synchronized block? What are the two ways to perform static synchronization? What is deadlock and when it can occur? What is interthread-communication or cooperation?